(Newser) – Sales were way down at Papa John's outlets across the country in July—and "Papa John" himself is the reason why, the company says. President and CEO Steve Ritchie revealed Tuesday that sales were down 10.5% in July, and said "results have been challenged by recent events," CNN reports. 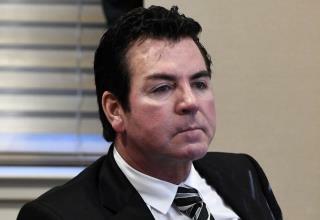 Ritchie told analysts that "very inexcusable and irresponsible comments" from founder John Schnatter, who used the n-word in a conference call, are to blame for the decline in same-store sales and a sharply downgraded outlook for the rest of the year, reports CNBC. People in up roar over a conference call.With hired outside company.For the purpose of preventing future ethics vilolations.But yet terms like (cracker)( honky) still acceptable on TV shows.Those are slurs also.It doesn't matter if had ga at the end of er .If it can be used in music.ANYONE should be able to use. Think is witch hunt by second in command.To get rid of him.Just saying. That's BS, his context is using the word was not racist at all, in fact the context used was the exact opposite. Witch hunt.